In the midst of all this Dreadtober madness, I thought I'd share a few photos of another project I've been working on. 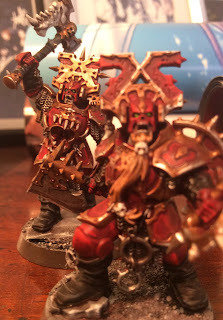 I want to clarify this by saying that these miniatures are at best a collaborative project and at worst just photos of wonderful things created by someone else. Regardless, behold! The mighty Lord in all his glory - or should that be gory? Now, I can't take any credit for the paint job on the Mighty Lord, it's all the work of a far more talented hand than mine (Berserkerbro). But I painstakingly built and assembled the model before handing it over, so I feel justified in posting pictures and claiming all the credit. I had slightly more to do with the grim faced fellows below. My love for you is like a truck, BER SER KER! My love for you is ticking clock, BER SER KER! 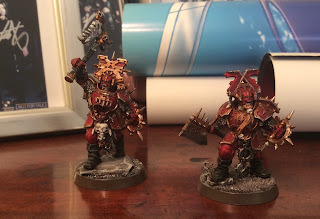 Not only were these guys lovingly crafted by my bare hands, I also applied the Khorne Red basecoat. I know, my skills are amazing. So, the question on everybody's lips is. Why on Earth are you suddenly messing about with all this Age of Sigmar stuff in the middle of Dreadtober? Sit back, relax and I'll tell you. 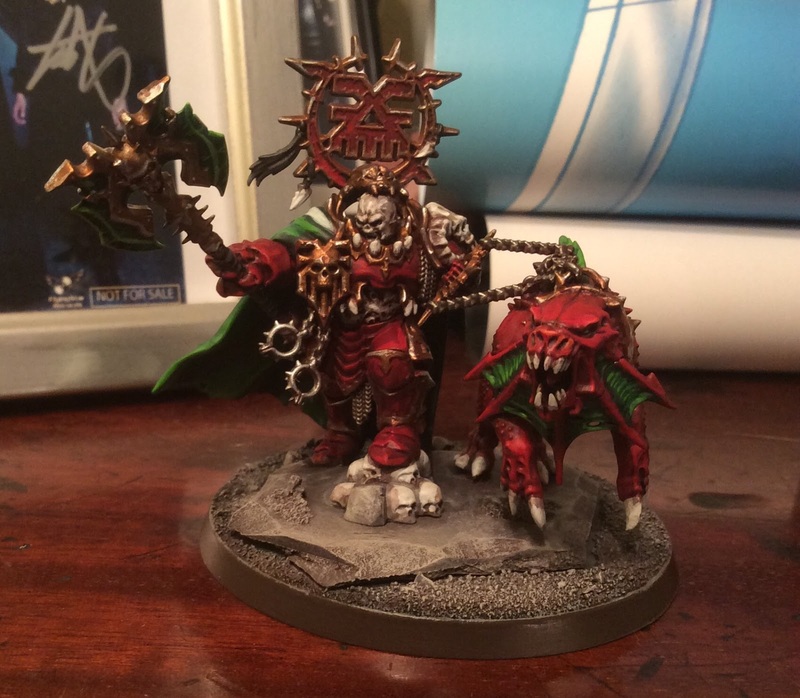 It all started when Age of Sigmar was first rumoured to be around the corner. I had a few discussions with Berserkerbro about possibly painting the minis for our FLGS. So I had a chat with Keith (proprietor of said FLGS) and he hummed and hawwed and even sashayed a little and then eventually said yes. 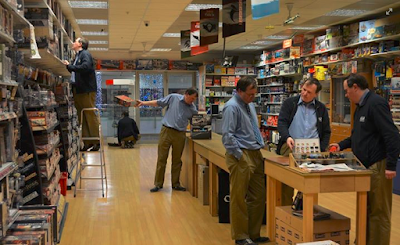 Marquee Models delivers exceptional customer service - mostly due to the cloning vats. So, if you're in the area, and you fancy seeing some of the minis in the flesh then come on down. If you ask really nicely, Keith will probably let you play a game with them into the bargain! Great paint job mate. And the Clerks quote made me giggle. Thanks Chris! Like I said, I can't take the credit but I'm constantly awed by the skills this particular painter possesses. Is it any wonder I can never win the local painting competitions? !